Sometimes you have to look at things a little differently when DIYing and repurposing. 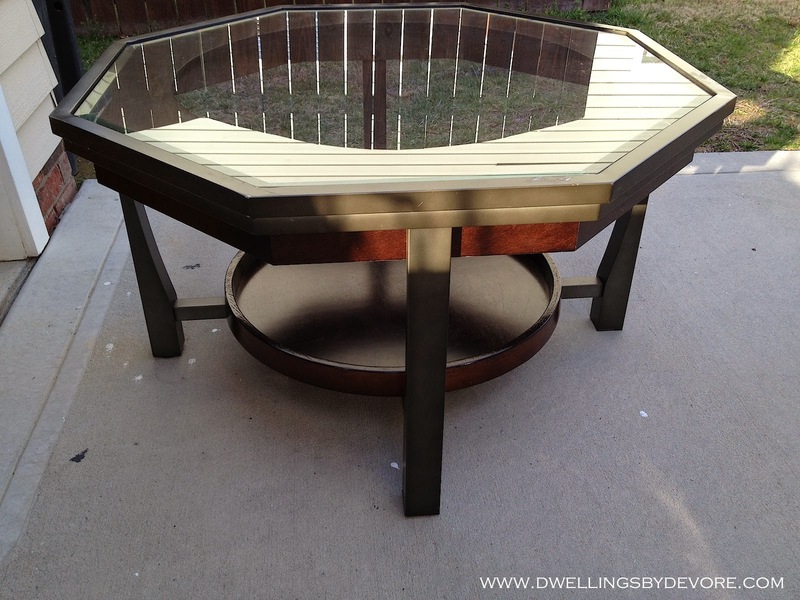 That was the case with this coffee table. My in laws gave it to me to makeover and resell. It came out of their beach house and had some wear and scratches. I planned to just repaint the whole thing and sell it. 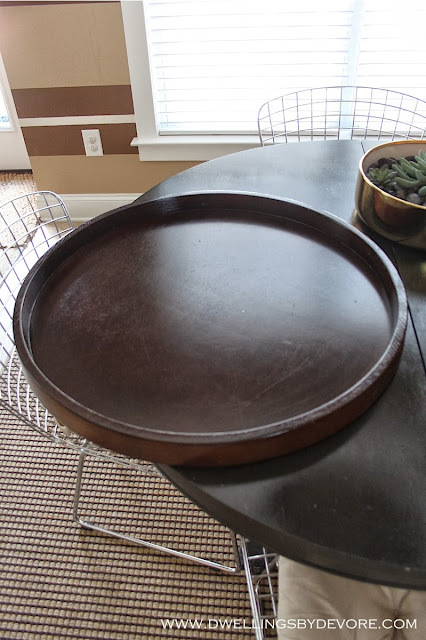 Well, when I started looking at it, I realized that the round tray portion on the bottom would make a really nice tray for my house. I didn't need a coffee table, but I can always use a good tray! It was screwed in from the bottom, so I just unscrewed 4 screws and it came loose. There are still four small holes on the bottom, but you'll never see those anyway. It's larger than your average tray, which I like. It needed a little something to break up the sea of brown though. So I reached for the gold leaf. There are lots of tutorials on leafing, but you basically just spray or brush on your adhesive, wait for it to get clear and tacky, and then apply your leaf. Since I planned to set things on this tray, I used some spray sealer to finish everything off. 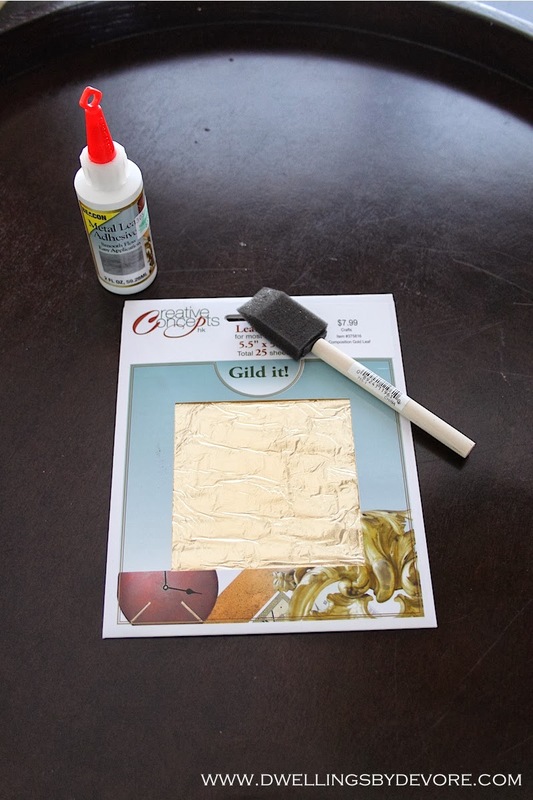 I still love gold spray paint, but it doesn't shine like gold leaf. You already saw a peek of it in my fall home tour, but now you know how it came to be :) So I guess the moral of the story is to look at all the pieces and parts of something before you decide if you can use it. Obviously I wouldn't buy a brand new coffee table just for the tray, but if you come across something tossed to the curb or for a steal at a thrift store it might be worth it to take a second look. p.s. I was still able to paint and resell the coffee table so it didn't go to waste! love it! i love gold leaf- it looks perfect with the dark wood. I love larger items and the size of this tray is great. The gold leaf is gorgeous! 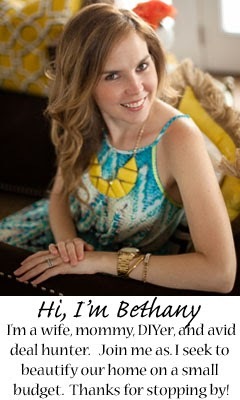 Never tried gold leafing before but you make me want to try Bethany! Those colors just make me happy for fall. I think it looks great! 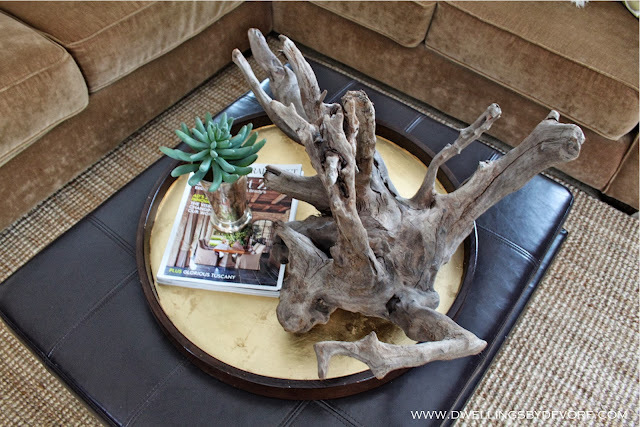 Love the gold against the driftwood ~ great vision, Bethany! this looks awesome!! 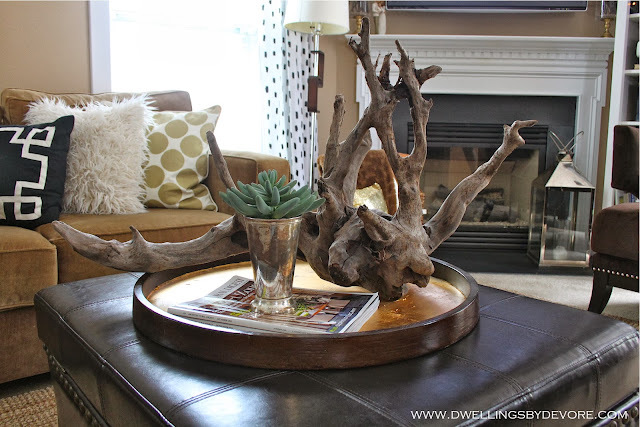 Love your huge piece of driftwood too! It looks great on there!! I admire someone who can look at something and imagine it re purposed as something else. It's very handsome and I like that you decided not to paint it either. That gold is fabulous! And the driftwood on top - awesome. Thank you! Driftwood is one of my favorite things, you just can't beat the texture of it. Thanks so much Amy, I really liked the contrast of the wood with the gold. You definitely should, it's so easy and gives such neat results!